The distinction between Latin and European playing styles is of vital importance to American soccer. It is intimately related to the question of a playing style for the U.S. men’s national team. Briefly: during its 100-year history in the USA the sport has been largely organized and controlled by European immigrants or by Americans under European influence. I can narrow that down, because most of the European influence has come from Britain and from Germany. Which, for most of those 100 years, was just fine. But it’s anything but fine today. Over the past three decades a massive change has come about in the ethnic composition of the American population. Hispanics are now the largest minority group in the country. A large proportion of the Hispanics are soccer-oriented, and they, of course, play the Latin way. That short paragraph ought to be followed by one describing how traditional American soccer has welcomed the arrival of tens of thousands of soccer fans and players -- a quite extraordinary windfall for a country still working hard to build up soccer’s popularity in this country. Well, there is no such paragraph. Because the American “welcome” has been either non-existent or tepid. This has to be one of the all-time great sporting blunders, a really colossal collapse of common sense. So complete has been the silence from soccer’s leaders, that one can legitimately ask what ought to be a fatuous question: have these guys even noticed what is going on? But the question is not fatuous. For decades now I have been trying to strike up conversations on the topic with scores of these so-called leaders. Frankly, a waste of time. The replies have ranged from frivolous to hostile, taking in genuine puzzlement, but virtually always they have been uninformed and/or evasive. And it does not get any better. My colleague Mike Woitalla, in a series of interviews on this website, has been asking a bunch of top soccer guys about the development of a U.S. style, and has managed to bring up the matter of the Hispanic players. I wonder -- has it ever entered Mooney’s mind that what the U.S. coaching schemes offer might genuinely not appeal to those who like Latin American soccer? Doubtful. That would involve Mooney and Romeijn in the many subtleties that distinguish the Latin American game from the European. If there’s one thing that jumps off the page when both Romeijn (who is Dutch) and Mooney speak, it is self-satisfaction. Romeijn admits, “We acknowledge there are different ways of teaching,” which is big of him, while also proclaiming that, “We are confident that we are doing it the right way.” Self-satisfaction becomes smugness. No doubt, Mooney and Romeijn would like an almost hilariously diverse army of coaching instructors. They’d all be teaching the same thing, though? Well, no. Because Romeijn makes it clear that what they’re after is uniformity of teaching technique. Without getting into pedagogic technicalities, I think that translates into this: these Federation-licensed coaches must be above all top-rate teachers. Super experts at getting their message into their pupil’s brain, at making their sessions understandable, etc., etc. Certainly commendable. Probably we’ve all suffered under teachers who made an hour’s class seem like a year. Anything to avoid that is obviously a good thing. Romeijn’s interest seems to end there. Neither he nor Mooney show much interest in what these coaches are teaching -- interest in the strictly soccer part, that is. And what do coaches discover when they’re guided by instructors who know little of Latin soccer? Enough. It is clear that the entire Federation coaching scheme is in the hands of people who, while not necessarily hostile to Latin soccer, really can’t be bothered with it. The huge, and growing, reservoir of Hispanic coaches and players is being slighted. They can join in if they agree to Europeanize their thinking. That is probably seen, by the Federation, as the ideal, an Americanization program. Are things now suddenly to get better under new President Carlos Cordeiro? Oh no, there’s little hope of that. Cordeiro’s “open letter” to the youth soccer community last June, set up a five-man task force to look into five “critical issues.” The task force does not include a Hispanic, and the word Hispanic did not appear in the open letter. This time, from the very top, the U.S. Soccer president himself lets us know that he’s unaware of any Hispanic issue that needs to be addressed. U.S. Soccer is badly at fault, but the situation is little better elsewhere in American soccer. Look at the coaches, look at their massive annual convention, with its overwhelming presence of European guest coaches. Has there ever been, among the thousands of talks, lectures, clinics and discussions given there over the past three decades, even one devoted to “the Hispanic question”? Not that I’ve been aware of, and I’ve attended most of those events. The colleges? How many Hispanic coaches or players do they have? College soccer, high on speed and hustle, is about as far removed from the Latin game as is imaginable. MLS, with a greater international presence, does a bit better. But it has taken them nearly 20 years to arrive at today’s point, where key players are also key entertainers and are also largely Latin Americans -- think Higuain, Valeri, Lodeiro, Acosta, Piatti, Vela, Almiron, Maxi Moralez et al. Precisely the sort of players that this country, with all its resources, its academies, its elaborate coaching courses and licenses, consistently fails to produce. Yet, at a younger age, those players already exist here. In the youth ranks there are plenty of young Hispanics who are trying to learn to play that way. Who have Maradona and Messi and Neymar as their heroes and models. Are they encouraged? They are not. 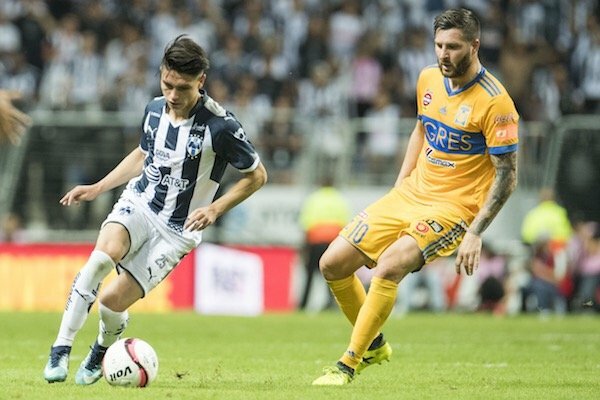 The recent case of youngster Jonathan Gonzalez, now playing for Mexico rather than for the USA, exposed the slip-shod way that the Federation pursues young Latino players. Yet when there is determination and real belief, the results can be outstanding. Some years back David Armstrong, an Englishman, son of Derek Armstrong of La Jolla Nomads fame, decided to recruit the best Latino kids he could find in the neighborhood. Of course, it wasn’t easy, but Armstrong persisted and formed an under-9 team, pretty much a 50-50 mix of these Latino kids with the traditional La Jolla white kids. The team won a couple of state championships, then -- in 2002 -- it won the U.S. U-14 national championship. Eight of that team’s field players were Latinos. Ramos later told me that he had not concentrated on choosing Latino players, but that “I wanted players who were not afraid of the ball.” So, the players he wanted, who could play the style he wanted, turned out to be predominantly Hispanic. That team could have marked the arrival of style for US teams. It would have been, obviously, a Latin style. Well, why not? We have those players, if we care to use them, and they are the only ones who bring with them the elements of a style. Ramos’ team did not do well in the subsequent U-20 World Cup. Hardly surprising in a group made up of France (the champions), Ghana (semifinalists) and Spain (quarterfinalists). That didn’t help. But the bigger misfortune was that Ramos fell under the influence of Jurgen Klinsmann. He never again had eight Hispanics in his starting lineup. But the point had been made, it was there to see for anyone who wanted to see it. The incredibly obtuse nature of the American soccer establishment triumphed again: even though it could not come up with a style of its own, it was not about to accept the Latin style. There could be many reasons for that stubbornness. They range from a simple inability to understand the situation, or not wanting to accept change, through a fear of “the Latinos” taking over, and on into much murkier areas. Those reasons do not concern me. It is enough to know a) that there already exists in this country a growing community of players who have a definable style of playing, and b) that, for whatever reason, their contribution to the development of American soccer is being obstructed. Would the Latinos “take over”? In one sense, yes. Their style is there, ready to be used. The other half of American soccer, the non-Latino half would have to adapt. But we know that can be done. Two of the most successful American players, Landon Donovan and Clint Dempsey, both spent much of their youth playing on Hispanic teams. The crucial thing is that American players learn -- are taught -- early that ball control, comfort with the ball, ease of movement on the field, is the quintessential starting point. The Federation needs to set the example here. To do that it needs to embrace Hispanics. Not by making the occasional paternalistic gesture, but wholeheartedly, by making a serious commitment to ensuring that Hispanic coaches are a vital part of the coaching set up. While their approach to the game is being adopted, they should be the most important people around. Is it possible to imagine anything like that happening with people like Romeijn and Mooney in charge? People so confident of their own importance that they cannot see that this country is quite literally wasting a huge bloc of its talent. They cannot even see the uniquely promising situation in this country, where both the Latino and the European styles are strongly represented, cannot see the exciting challenge that presents for working out a blend -- an American blend -- of the two. But the U.S. coaching setup is permeated by European thinking, designed by people who have never faced, never thought about, how to accommodate two varying styles. Am I saying that they should be creating a new style of play? No -- the style will not be new. Is it likely that, after about 150 years of worldwide soccer, a totally new style of playing will emerge? It is not. The USA has to take sides here -- European or Latin American. The choice should be made for the Latin American game, a choice that would immediately enfranchise the huge -- and growing -- numbers of Latino players and coaches. Under those conditions, where Latino coaches would know that they could compete for truly influential jobs in the Federation, that their own talents were needed, that they were not being asked to become just another compliant part of a basically European setup, it is quite likely that the lack of interest noted by the Federation’s Ryan Mooney will disappear. A decision to adopt a Latin style would demand new thinking right down the ladder of player development. New thinking, new personnel, and, finally, a recognizable style for the U.S. national teams. Be it understood: style is not a merely cosmetic affectation. I refer back to Tab Ramos’s desire to find “players who are not afraid of the ball.” That is the nub of the matter. A whole team of players who want the ball, who can smoothly control it, pass it, dribble it, shoot it, head it. Players who like nothing better than to have the ball at their feet -- which means that a style is already forming, it means those players will want the ball on the ground. From that come the skills of super-accurate short passing, of intricate close inter-passing ... and all the “airs and graces” that I mentioned at the beginning of Part 1 of this survey. And since you ask, no, I have absolutely no faith whatever that the current U.S. Soccer coaching setup can perform the agonizing reappraisal that is necessary. It is quite possible that the necessary rethink will have to be forced upon them, something that would call for a more activist approach from the Hispanics themselves. The appearance of leaders from their own community to carry forward their struggle for the recognition of their futbol is long overdue. 17 comments about "America in search of a style (Part 2): The USA's shameful refusal to recognize its Latino talent". jim broshar, November 9, 2018 at 3:37 p.m.
Well put. I'd only add that the problem goes back further than three decades. And the US Soccer power also was predominantly East Coast-centered, west coast also often overlooked. Mike Lynch, November 9, 2018 at 3:47 p.m.
beautiful game, November 9, 2018 at 4:41 p.m. Sorry Paul...we have lots of talent that hasn't bloomed because of the system, not style. Bob Ashpole, November 9, 2018 at 5:52 p.m. In the 1970s and 80s there was a distinct "Latin" style. It was characterized by short passes and very little movement off the ball. The person on the ball was far more energetic than everyone else. Then there was a Northern European style, which included much more running off the ball in support, and an emphasis on combination passing. Players off the ball were expending more energy than the player on the ball. Playing outdoors year round in freezing temperatures and on field temperatures over 110 degrees made me think of the two styles as "hot weather" and "cold weather" styles. In the last 30 years the differences in styles have largely disappeared. Latino coaches and players have been and still are a major influence on soccer throughout the world. The "Latin" style has evolved to become more European. I have never played on a team that did not include some Hispanic players. Those players find a way to meld their style of play with the others on the team. A common aproach 20-30 years ago was to use Latino players up front in the attacking positions. That wasn't ideal from a soccer standpoint because the team tactics were not really changing, just play in the final third was changed. Barca and Cruyff, however, showed the world how to bring Dutch Style principles of play to the Latin Style. A lot of people still only have a superficial understanding of what happened at Barca, but they all still know that it is possible to meld the best of Northern European soccer with the best of Latin soccer, even if they don't know how to do it themselves. It has been at least 20 years since I have seen a team playing the 1970's version of Latin style. International transfers of players and hiring of coaches as well as TV have changed how people play. If we are going to call the post-Cruyff Barca style, a Latin style, I have to disagree. Barca has both Northern European and Latin aspects to its style of play. Bob Ashpole, November 9, 2018 at 6:06 p.m. I just realized Paul and I are talking past each other. I am talking about senior soccer in the USA, which is overwhelmingly not affililiated with USSF and overwhelmingly amateur. He is talking about USSF and USSF sanctioned soccer matches. I played in about 800 adult organized matches, only about 50 were competitive matches (in competitions against college teams), and only about 10 matches were USSF sanctioned. So when I think of soccer in this country, I don't think about USSF sanctioned matches unless we are talking about professional soccer. USSF has little if any influence on unaffiliated play. In fact for most of it, FIFA LOTG are not strictly followed. Kevin Leahy, November 9, 2018 at 6:28 p.m. It is curious to me how people that have been successful like, Hugo Perez, Tab Ramos & Oscar Pareja are being over looked. Have seen a few Hispanic players that are deserving of looks for state level teams. It is an issue in this country and we need someone that, will address it. It is not just money that keeps these players from being seen. Being talented should be what comes first always. Ric Fonseca, November 9, 2018 at 6:45 p.m.
First, thank you once again, MUCHAS GRACIAS Don Pablo Gardner, for your support. I sincerely appreciate your efforts to have the "U.S. Latino Style" be heard! I do have a concern in relation to Paul's attention College Soccer, with which I've been intrinsically involved most of my adult life, and that is that while I concur with PG's short assessment of the dearth of Latino Coaches at the college level, there is more to meet the eye than what he says. College soccer coaches are not a "dime a dozen" as one would find for baseball, basketball or football, first given the archaic rules, regulations, by-laws, etc that the even more archaic NCAA and their lesser cousins (NJCCA) NAIA, apply to the college game. However, it MUST be noted that recruitment of collegiate players also carries a lot of other requirements/requisites, e.g. grade point averages for admissions, the dreaded SAT/ACT test score, financial aid, etc that are usually - if not always - mandatory for ALL "student-athletes" the emphasis placed on student. Now this would and could open up a lot of discussion, but what about the Latino Student Athlete? Several that've made it in the pro MLS ranks, and I'd let you figure out who they are/were (hint: two were Carson Galaxy team mates) but then again I consider them as exceptions to the rules. As for Latino college coaches, easier said than done simply and because of the myriad requirements and regulations that al prohibit - and in some cases, inhibit - the signing of Latin College Coaches. And then there is the situation of a community college/junior college systems, transfer requirements, etc., and YET AGAIN would necessitate another article or perhaps even a study put authored by a well intentioned sport sociologist or psychologist. Well, pilgrims, I leave you to ponder this Paul Gardner article, that once again I respect and welcome, and so Hasta la vista y muchas gracias Don Pablo!!! Mario Cesarone, November 10, 2018 at 8:22 a.m. This U-20 Team makes Mr Gardner's point quite well. Lots of Hispanics and all the players seem to be good ball hadlers with field vision as seen from some exquisite passes. Bob Ashpole, November 10, 2018 at 11:33 a.m. The only thing I regret about this topic is that it falsely appears that we are talking about race and ethnicity. We are talking about good players and playing good soccer. And we are talking about closed minds and prejudice of a different kind. Good Latino players are not good because they are Latino and don't play good soccer because they are Latino. They could have chose to play another sport instead. These players are what they are because they took advanatage of the playing and training opportunities that they had--and it wasn't suburban USSF pay-to-play programs that made them what they are. What USSF should be asking is 1) why can unorganized neighborhood soccer turn out great players world-wide and 2) what happens in the ethnic leagues that is different in USSF suburban pay-to-play programs? Ethnicity is a distractor. USSF needs to look at the soccer. There are individuals in USSF that know the answers to these questions from having "been there and done that." So why as an organization does USSF not embrace the development of good players and the play of good soccer? I believe that it is because the business interests are controlling the game. I don't think that USSF will change its soccer approach until it sets out an independent management team for the sports side. I am back to advocating that USSF splits its CEO position in two, one CEO for soccer business and one for the game itself, both reporting directly to the board as well as being on the board. Ric Fonseca replied, November 10, 2018 at 1:32 p.m.
Ric Fonseca replied, November 10, 2018 at 1:44 p.m. Sorry folks I hit a wrong key and submitted my comment before finishing the thought: "The term should read "Hispanic Parent/Coach" singular, 'cause, only and unless one has been around the Latino/Hispanic competition, it is very obvious that it is usually ONE father who takes on the role and responsibility to teach/train/coach/ the players as opposed to the Anglo style in which the administrative/teaching/training/coaching of the usually "pay for play" organization a la USYSA, ayso, "club", etc. R2 Dad, November 10, 2018 at 11:40 a.m.
Great column, PG. This could be the moment when there is a transition in player pool and coaching selection, but I don't see it happening yet. Is it perceived that since Tab's U20s didn't win the title that didn't become a turning point? These teaching coaches should all know that winning the final is not validation of the process--the players the process develops are validation. As a sidenote, I don't see Latin Style as always with the ball on the ground. Many Hispanic parents and youth coaches are agnostic about this, and I have refereed many, many youth matches of Hispanic teams where the ball is in the air more than on the ground. Not sure why that is, since it makes control of the ball more difficult, not easier. frank schoon, November 10, 2018 at 2:11 p.m.
American players. I wish Holland , Yugoslavia and Brazil/Argentina were the main influece in the development of US soccer. I don't want to hear this garbage about ,"Oh, we need to play latin style" or "we need more Latin influence in our soccer because we have more latinos . If you think that is the problem with our game ,than you don't understand soccer...a reread of Bob's comment will explain that nuance. To me a good youth coach is a coach who creates and makes players comfortable on the ball. And to further make players better technical and comfortable on the ball,is accept the need of having a sub culture of "street/pickup soccer, otherwise we'll keep producing nothing but PROGRAMMED,NON CREATIVE , STIFFS TYPES that come out of the soccer academy mills like puppy mills. With the large and ever grown Hispanic community along with the tons and tons of Hispanic youth players, you would think by now, just by the numbers or law of average, we would have seen some great naturally talented hispanic youth players coming out of the woodwork, NOTHING!!! The only talented hispanic players in the MLS come from 2nd and 3rd world countries..GO FIGURE!! Yes, we have poor hispanics communities here, but what about those hispanic MLS stars who came from countries who are in much poorer shape then those hispanic who live and grow up here. Guys like Romeyn, from my country and that other nitwit need to go. Hire some former great players, as an example , a la Valderama, a la Cubillas or 'bout Chris Waddle of England, or other greats who have more feel for the game...We don't need these Pedantic types, classroom professors, Programmed laptop coaches, these LICENSED idiots...We need people to run USSF soccer who actually have done something, and not those types who are good in classrooms,flip-over charts, computers, video analysis, who'd trouble taking on a lamppost one on one but only tallk a good game. Ben Myers, November 10, 2018 at 11:40 p.m. I see selection of talent as the greatest influence on playing style. We have too many poorly qualified or unqualified coaches and club officials at the grassroots level selecting the really big kids for the first team. This is undeniably the influence of the American game played with a pointy ball. Problem often is that the big kid relies on physical prowess and does not make the effort to develop technically. Give me a bunch of scrawny, quick-footed enthusiatic young players any day. Been selecting like this for years, with good effect. I am doing it right now with not a first team of small boys who love to play, who practice wide-eyed with smiling enthusiasm and play the same way. This fall has been a ball. For all. Can't wait until spring soccer. The other grassroots issue that also relates to coach and administrator inexperience is the number of players on a team. My boys have played several times 9v9 against sides with as many as 16 players, who miss out on playing time and maybe end up walking away from the game because it is no fun sitting on the sidelines. The club I coach for now went with short rosters, so I have 11 players for 9v9. Only once have we had 11, once 10, once only 8, the rest 9 due to illness, broken bones and other sports. The kids are thriving. Would I like more? Well, I would not mind having ONE substitute for every match. Then I can better prepare the substitute to enter the game and making coaching points to the player who comes off the field. No kids whining on the sideline wanting to go into the game, either. Instead, it seems that there is a coach's paranoia about not having enough players, because of the emphasis on winning even rec matches. Nope, below U14 is for player development, and players develop best in the heat of reasonable and reasonably even competitive play. Bob Ashpole replied, November 13, 2018 at 8:45 p.m.
Good points, Ben. A player development coach ought to be paranoid about not having enough players attending training sessions. If a coach is trying to teach 1v1 skills, matches have little development value. When I was coaching that level decades ago, matches had 1 ball for 22 players. 1 ball for 14 players is no improvement in my view so not much has changed for the better in 2 generations. beautiful game, December 5, 2018 at 11:41 a.m.
Until the USSF overhauls its coaching system to a proactive technical development criteria, nothing will change. The first crucial taboo in youth soccer is the "get rid of it" mentality. Insisting on negativity from the start and re-enforcing it at various stages of development creates an indecisive player mentality that is almost impossible to reinvent. Individual and purposeful training sessions are meant to hone technical skills as part of the team platform. When "get rid of it" starts eartly and is solidified mosly in high school; it continues to be a negative mental weight in senior competition. What is the first criteria a youth travel team coach should look for? IMHO, it's comfort on the ball, intuition, and attitude.